Given the thorough integration of social media into the lives of the majority of American teens, it is no surprise that these sites play an important role in the establishment of friendships and the everyday back and forth of peer relationships. This chapter takes an in-depth look at the role of social media in teens’ friendships, looking at teen friendships more broadly defined. Social media is an important venue for interaction and conversation among America’s youth. Fully 76% of all teens use social media. Facebook is the dominant platform, with 71% of all teens using it. Instagram and Snapchat also have become increasingly important, with 52% of teens using Instagram and 41% using Snapchat. One-third of American teens use Twitter and another third use Google Plus. Fewer teens use Vine or Tumblr. Social media plays a critical role in connecting teens to new friends, allowing teens to learn more about new friends and get to know them better. Nearly two-thirds (64%) of teens who have made a new friend online say they have met new friends on a social media platform. Two-thirds (62%) of teens say they’ve shared their social media username with a brand new friend as a way to stay in touch. Beyond making new friends, social media is major way that teens interact with their existing friends. 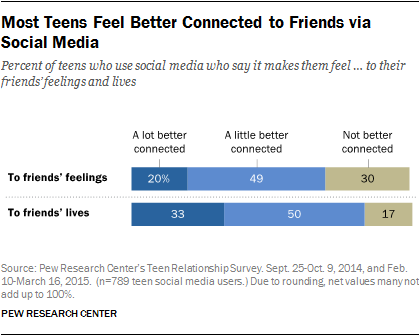 More than nine-in-ten teens (94%) say they spend time with friends on social media. Fully 30% say they spend time with friends on social media every day, and another third (37%) say they do so every few days. When asked to rank the ways they communicate with friends, social media sites like Facebook or Twitter are one of the top ways of communicating with friends for two-thirds (66%) of teens. As discussed earlier in the report, social media is a critical platform for making and staying in touch with friends. Given this, and the frequency with which many teens use social media, it is not surprising that teen social media users report that social media makes them feel better connected to their friends’ feelings and to information about what is going on in their friends’ lives. More than eight-in-ten (83%) social media-using teens say social media makes them more connected to information about what is happening in their friends’ lives and 70% say these social platforms better connect them to their friends’ feelings. Girls who use social media are more likely than boys to say they are “a lot” better connected to information about their friends’ lives (40% vs. 26% boys) and their friends’ feelings (24% vs. 16% of boys) thanks to social media. While teens of all races and ethnicities are equally likely to feel more connected to information about what’s going on in their friends’ lives through social media, black youth are more likely to say they feel “a lot” more connected. Hispanic teens are more likely than whites to say they feel more connected to friends’ feelings through social media, with 78% of Hispanic youth saying this compared with 65% of white youth. Smartphones offer near constant access to friends and for social media users, their friends’ online postings. Not surprisingly, teens who have access to smartphones and use social media are more likely to report that they feel “a lot” more connected to what’s happening in their friends lives than teens without a smartphone. While both groups are equally likely to say they feel more connected to friends through their social media use, 36% of smartphone owners say they feel “a lot” better connected to friends while a quarter (25%) of teens without smartphone access report the same degree of connectedness. Even as teens often feel better connected to friends’ feelings and information about their lives through social media, they also report that they are sometimes too connected to their friends’ lives. 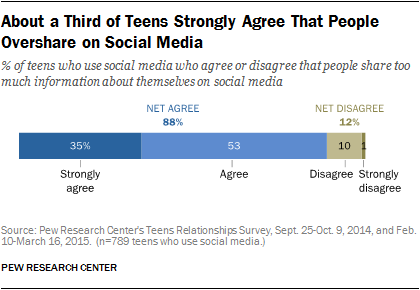 Fully 88% of social media-using teens agree that people share too much information about themselves on social media, with 35% agreeing strongly. 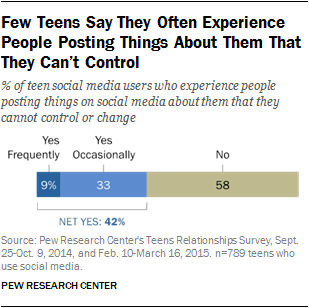 These data hold true regardless of which social media platforms teens use. Teens from rural areas are more likely to agree strongly that people share too much information about themselves on social media than their urban or suburban counterparts, with 46% of rural teens strongly agreeing, compared with 31% of suburban teens and 39% of urban youth. Social media not only connects teens to information and friends, but also connects them to opportunities for social support from their friends, peers and broader social networks. 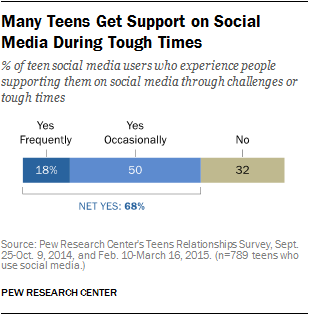 Among teens, 68% have received support on social media during challenges or tough times. Following adult gender patterns around asking for and receiving social support on social media, girls are more likely to report receiving such support on social media, with nearly three-quarters (73%) of girls garnering support, compared with 63% of social media-using boys. When examining overall support on social media during tough times, white social media-using teens are more likely than Hispanic teens to report receiving support on the platforms. Nearly three-quarters (72%) of white teens who use social media receive support for tough times on these platforms, while 59% of Hispanics receive similar encouragement. Digging down into the data, black teens who use social media are just as likely overall as white and Hispanic teens to garner support on social media in these situations. Still, they are more likely than white youth who use social media to say they receive that support frequently – with 28% of black teens reporting frequent support, while 15% of white teens report similar boosting from their online network during tough times. Social media-using teens from households with more modest incomes are more likely than teens from the wealthiest families to say people frequently support them through challenges on social media. While 23% of teens from families earning less than $50,000 annually say they frequently have people supporting them on social media, 14% of teens from families earning more than $75,000 per year report frequent support. Smartphone users are more likely than teens without access to smartphones to say people support them through challenges or tough times through social media. Fully 71% of smartphone-using teens who use social media say people support them through tough times on those platforms, while 58% of teens without a smartphone say the same. Even as social media connects teens to friends’ feelings and experiences in ways both positive and excessive, that same sharing can reveal events and activities to which teens weren’t invited, and can lead to negative comparisons between their own lives and the lives of those they are connected to on social media. 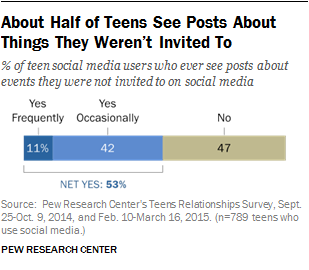 A bit more than half (53%) of social media-using teens have witnessed others posting to social media about gatherings, events or parties that they weren’t invited to. Most teens don’t experience this very often, with the bulk of teens (42%) saying it happens occasionally and just 11% saying it happens frequently. Teens from households with more highly educated parents are more likely to say they haven’t been invited to events they later saw posted on social media. Two-thirds (65%) of teen social media users with parents with a college education or more say they’ve seen postings for events they weren’t invited to, as have half (50%) of teens whose parents have completed some college and 47% of teens whose parents have a high school diploma or less. Social media exposes teens and adults to information about the lives of their friends. Given what we know about how teens curate and manage information posted to their social media platforms, some profiles post a highlight reel of individual lives, rather than a fuller picture of ups and downs. And while some youth feel worse about their own lives because of what they see on friends’ social media postings, the majority of teen social media users say they generally do not feel bad about their lives based on what they see on these platforms. More than three-quarters (78%) of teens say they do not feel worse about their own lives based on what others post to social media, while 21% of teens say they do. Among those who do feel worse about their lives based on what they see on social media, most do not feel this particularly acutely; 17% say they feel “a little” worse and 4% say they feel “a lot” worse. More than a quarter (28%) of Hispanic teens report feeling worse about their lives because of social media postings, significantly more than the 12% of black youth who feel this way. The difference between these two groups and the 21% of white teens who say they feel worse is not statistically significant. Teens as well as adults spend time curating and planning how to present themselves in online social spaces. Adults have often admonished teens to think carefully about what they post and share online, and in many cases, teens have taken this to heart. Online profiles and presence are constructed things for youth. With this need to be careful comes a need to present themselves to multiple audiences – to be authentic and compelling to peers and to simultaneously present a potentially sanitized and appropriate digital persona to adults like parents, teachers, future employers and college admissions officers. Teens struggle to balance the needs of their different audiences and it shows in the pressures they experience and the attitudes they express about how their peers present themselves. Some 85% of teen social media users agree that people get to show different sides of themselves on social media that they cannot show offline. This sentiment is consistent across most major demographic groups. Teens with access to smartphones are also more likely to say people show different sides of themselves on social media, with 88% of smartphone owners agreeing with that statement, compared with 76% of teens without a smartphone. Even as teens have the opportunity to share parts of themselves on social media that they can’t share in person, those same self-presentations don’t always feel authentic to their peers. Roughly three-quarters (77%) of social media-using teens agree people are less authentic and real on social media than they are offline. Again, there are few major differences among different groups of teens in their agreement with this statement. While a majority of teens do not feel pressure to post content that makes them look good to others (such as parents or peers), 40% of teens do report feeling pressure to post positive and attractive content about themselves. The bulk of teens (30%) report feeling “a little” pressure, while just 10% say they feel “a lot” of pressure. Teens with more highly educated parents are substantially more likely than teens who have parents with less education to report pressure to only post content that makes them look good. More than half (54%) of social media-using teens whose parents have a college degree or more report such pressure, while about of third of teens whose parents have some college experience or a high school diploma or less say the same. The bulk of teens whose parents have a college degree (42%) report feeling the pressure “a little” – just 12% feel “a lot” of pressure to post only positive content about themselves to social media. There are no significant differences between boys and girls, different ages or races and ethnicities in feeling this pressure. Teens who are generally more interactive with others in a digital space – using it to make friends or play games with people they have never met – are all more likely to feel pressure to only post content that makes them look good to others. 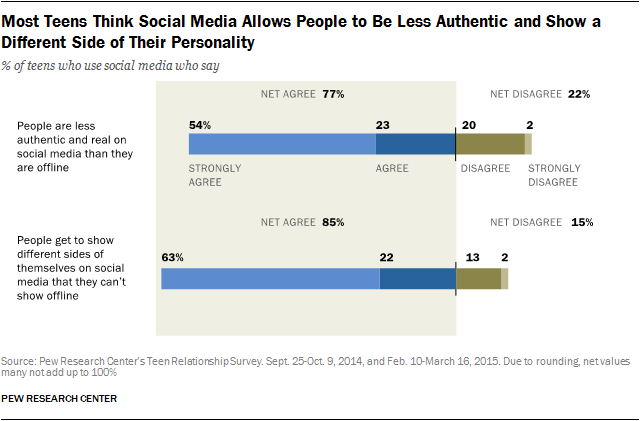 Many teens want to be liked by friends and peers and that extends to digital “likes” as well. In addition to the pressure some teens feel to post content that makes them look good, teens also feel pressure to post content that others like and comment on. 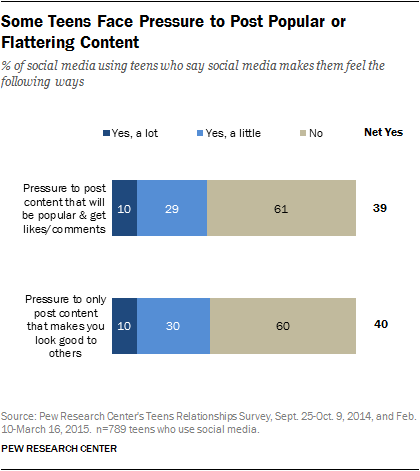 Similar to the percentage of teens who feel pressure to post content that makes them look good, 39% of teens on social media say they feel pressure to post content that will be popular and get lots of comments or likes. Teens with more highly educated parents are more likely to report feeling pressure to post content that will garner likes or comments on social media. Nearly half (47%) of teens with parents with a college degree or more report feeling such pressure, while just 36% of teens whose parents have some college experience and 35% of teens whose parents have a high school diploma or less report feeling pressure to post well-liked content. However, there are no differences between boys and girls, younger and older teens, or those of different racial or ethnic backgrounds when it comes to feeling pressure around posting content that others will like or comment on. Teens who feel pressure to post content that garners likes or comments frequently feel that they must post only content that makes them look good. Fully 59% of teens who feel “a lot” of pressure to post popular content feel similarly pressured to post content that makes them look good to others. Older teen social media users are more likely to say they’ve experienced this: 46% of teens ages 15 to 17 say they’ve had people posting things about them that they can’t change, compared with just over a third (35%) of teens ages 13 to 14. Broadly, there are no differences between boys and girls in their likelihood of having people posting things about them that they can’t change or control. White teen social media users are more likely than Hispanic teens to report that people have posted things about them that they can’t control: 45% of white teens have experienced this, as have 32% of Hispanic teens. The 38% of black youth who have experienced this is not significantly different than white or Hispanic teens. All groups, but especially white teens, are likely to say this happens occasionally rather than frequently. Among social media-using teens, those with more highly educated parents are more likely than teens with parents with lower levels of educational attainment to experience people posting things about them that they can’t change or control. Nearly half (48%) of social media-using teens whose parents have a college degree or more say content has been posted about them on social media that they can’t control, while 38% of teens whose parents have a high school diploma or less report similar experiences.